Awaken love within hearts of men. 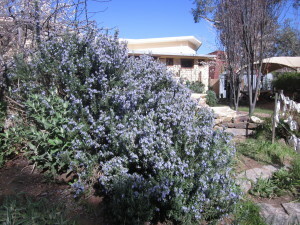 What an enjoyable and productive morning we had at our Working Bee on Monday. 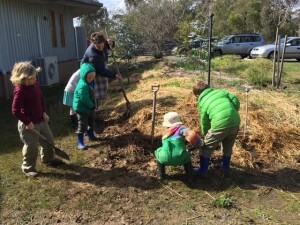 We began with a picnic morning tea of fruit and muffins, then set to work tree planting, weeding, pruning, raking out the hen house and digging into the vegetable garden, giving the hens fresh straw and generally tidying our garden. 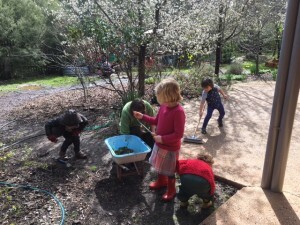 It was wonderful to see the children working together with parents, learning about plants, animals and how to use gardening tools. After all the busy work we sat together in the garden for our story. Thank you to all those who were able to come along for the special experience you gave the children. 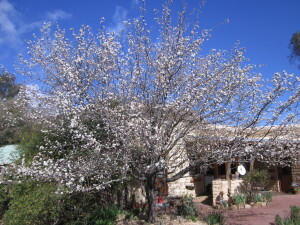 Our garden looks beautiful and tidy ready for spring. For those unable to attend we will plan another day next term. Our Spring Festival will be on the last day of term, Thursday 15th September, 8.45-11am. Class One have been relishing the rain with the rivers and ponds of mud it gives us to slosh around and get stuck, make mudpies and castles with strong walls and use our problem solving skills to create bridges and moats. Thank you to everyone who came to our class meeting last night. We had a very full circle with sharing and catching up. It was gratifying to feel your support for the class and hear your stories of the children’s enthusiasm. As I mentioned at the meeting due to family reasons I will be absent for a few days in the coming week; tomorrow, Monday and then three days the following week. The class will have Kate Dew looking after them on these days. Our King of Ireland’s Son stories have come to an end and our Main Lesson books are nearly ready to bring home to read and share with you. not in years or days. We have begun our new Maths Main Lesson “How much does it weigh?” We have begun with the introduction of how our bodies were used for the weighing of items by ‘hefting’. The children have had lots of fun weighing various items by using hefting and have found the inaccuracies with hefting. We have now moved along to the ‘yoke’ to measure items. With our class made Yoke the children have estimated and compared how many jewels it takes to balance a bean bag, doll, crayons and pencils. Next week we will continue with our measuring and move into the ancient Babylonians and their use of wheat as a measuring tool. Thank you to all those parents who were able to attend last weeks “Morning Circle.” The children loved showing you all our morning circle poems, songs, and rhythmic tables. They especially enjoyed playing their mini ensemble songs for you and have asked to do another mini ensemble for you! !……… A very big thank you to you all, for the flowers that were hand delivered at the end of the day!!!! It was a lovely surprise and I appreciate your thought and generosity. Please remember that your child still needs a spare change of clothes at school, especially with the building project as it is still muddy in the construction area. And to do what is right. We now let our fractions rest for a while and greet the animal kingdom in our next Main Lesson. This week we have studied the human being, looking at our similarities and differences to the animals. Project and our excursion to Werribee Zoo information will be sent home in the next couple of weeks. Spring rains are around and as we do not want to be indoors all of the time, students do need waterproof gear and a change of clothes please. I’m sorry I missed the last edition of the Penny – it took me a little while to catch up with the back-log of paper work which had accumulated during my absence! The Class seemed to have been very well looked after by Ellie and Kate and I enjoyed seeing the lovely work they produced with Botany and Story-Writing. 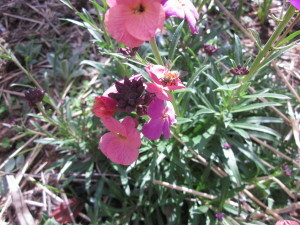 We are still having a few little experiments with plants and I wonder if the stories will ever be finished. I think that’s how it really is with writing a book – it can take years! We have worked on two Main Lessons this term. The first was the Epic of Gilgamesh, from Mesopotamia, a wonderful story which lent itself to dramatic illustrations and gave the children an experience in precis writing. Then we moved into the world of Mathematics and worked hard at reviewing and extending work we have done previously. The children are now realising the true value of all the learning of tables we have done over the years! Now we are learning about Ancient Egypt, a time of mystery and marvellous myth with so much art form and amazing architecture. It has been most rewarding to meet with those of you who have made appointments to talk with me this term. 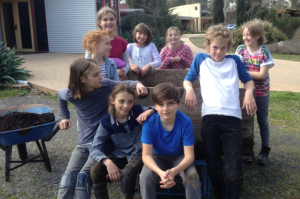 The class has also been meeting with Lorna and I in small groups, and we are looking forward to seeing the benefits of all of us working together to improve the social dynamics of the class. 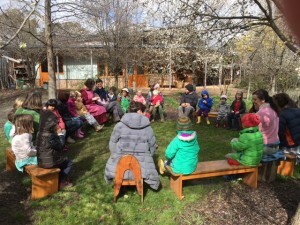 I have an excursion in the planning stage at the moment and some secret camp news to communicate soon – we are practising best manners in anticipation! Also we are in training for the Greek Olympics which are planned for next term. So much news! I will send out a more concise newsletter via Julie soon. Love and warm wishes to get us all through the last burst of cold weather! Work is progressing well on our play and we are very excited to be presenting ‘The Canterbury Tales’ on Wednesday 7th and Thursday 8th September at 1.45pm and 7.30pm on both days. We encourage everyone to come and enjoy some medieval humour! A reminder that Class Seven has a sailing camp in the first week of Term 4. More information will be available by the end of term. A number of students have been involved in a 3 day ‘Orchestra Victoria’ workshop this week. We hope they have had a great experience working with members of this orchestra, which culminates in a concert at the Capital Theatre, Bendigo. The following letter was sent by Emilia in Class Seven and her family who are currently travelling through Europe! We have now been travelling in our van for seven weeks. It seems like we have been gone forever. First, we spent one week in Lucerne (Switzerland) with my grandma, one week in Paris with our friends and then we travelled down to the Limousin area of France, were we spent ten days working on a farm. After that, we travelled all across France, from Bordeaux to Switzerland to spend another 2 weeks in Sarnen, Switzerland. We met Tully and Alby in Switzerland, and together we went up Mt Pilutus with the steepest cogwheel train in the world!!! Today I went up to our friends mountain house where we picked chanterelle mushrooms and lots of blue berries and made a risotto with the mushrooms. Tomorrow we are off to Slovenia via Italy. We will spend 2 weeks in Slovenia and then head down to Croatia. After that, we will head to Italy. We are loving travelling around, but also enjoy staying put and exploring. We enjoyed lots of different foods…French and Swiss cheeses, yummy bread and a soft drink you can only get in Switzerland. I hope you are all well and enjoying the rain this winter. 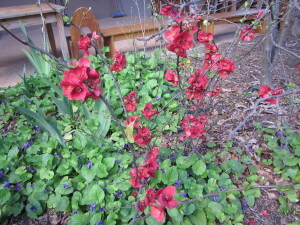 It will be so green this spring! Two weeks have passed since the students brought Shakespeare’s As You Like It to the stage. What a delight it was! The audience response was heart-warming and there has been lots of very positive feedback. And rightly so. The students have every reason to be proud of what they achieved in the time we had. But then, how empty seemed to be the days that followed. There was a definite sense of the Post-Shakespeare Blues. I even got requests to do another Shakespeare play. To meet that need we’re still lingering in the Bard’s world some of the time: in English practice lessons we’ve looked at the sonnets, we explored and wrote about Elizabethan theatre, there is a Shakespeare line each day and we’re even making a mini paper model of the Globe theatre. But in Main Lesson time we’ve moved on to another fascinating part of the Mathematics curriculum. It’s called Rhythms and Cycles and we’re investigating a range of topics: circular motion, Archimedes’ quest for the magic number p, planetary movements. So much to fire our imagination and rational thinking. The weeks are going by really quickly and before we know it the term will be over. However, there is still our City Camp from Wednesday 7th to Friday 9th September. Last things are being planned as we speak and soon you will receive the final details about food etc. Quelle surprise! A lovely surprise when I asked Class One whose birthday we were celebrating this week … and it was mine! The children sang Joyeuse Anniversaire beautifully and even had a piece of delicious gateau for me, although in answer to their question Quel age as-tu? we did not clap my age as we usually do, or we may have been there for some time! Merci, Class One! Classes Six, Seven and Eight are all busily exploring the building blocks of French: in Class Six we are investigating colours, shapes and prepositions; in Class Seven the construction of verbs and in Class Eight, questions and sentence structure. All of this will help us in communicating even more meaningfully in French. 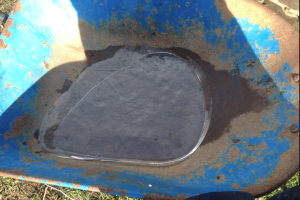 Spring feels like it has sprung, despite our wheelbarrow of ice this morning! 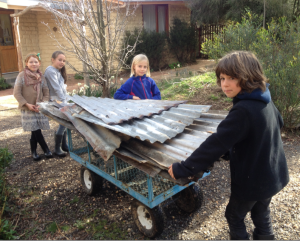 Children busy moving things, tin for our chicken house (thanks you Eloise’s family) and raised garden beds for our vegetables. Lots of energy! Music camps are a marvellous opportunity for your children to join in music making with their peers. It’s fun and social and well worth it! Your child will not want it to end and will certainly be planning to return the following year! Take a look at the Melbourne Youth Music and also the Geelong Summer Music Camp, which is also held in January. They are an invaluable experience for your child. The children and I have been undertaking various gymnastics activities lately, working towards performing their own group or individual gymnastics or circus performance in a few weeks. A visit from Sam Thomas from Castlemaine Circus next week will hopefully continue to excite and enthuse the children and provide them with some other useful ideas and skills towards their upcoming performances. Many children are very eager to showcase their gymnastics/circus skills and some have been preparing in small groups already, in their own time, which is very promising! I can’t wait to see what the children’s end creation! This should also be an opportunity for parents to come and watch their child/ren perform also. I hope you were all able to catch some of the Olympic Games while they were on recently. What an amazing spectacle it was. All the athletes who competed should be very proud of their hard work and achievements. Australia should also be very proud, totalling 29 medals. That is one medal per 820 thousand people, compared to the United States who achieved 121 medals at 1 per 2.65 million. Our neighbour New Zealand scored 18 medals at 1 per 255 thousand people. What an achievement! Perhaps we have a few aspiring Olympic athletes starting to emerge at our school also! Given some of the amazing gymnastics efforts lately, it wouldn’t surprise me! 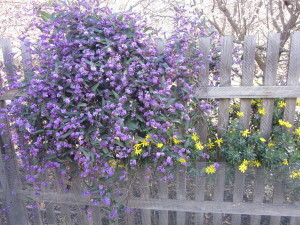 Looking forward to the warmer weather ahead and the beauty that spring has to offer! I’d like to express my gratitude for this amazing opportunity to work with such wonderful groups of children within a lovely environment. I am really enjoying it and I think the children are too. We are learning lots from each other and are all loving Spanish! 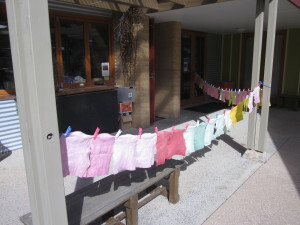 Newly dyed felt in spring colours made a lovely sight last Wednesday drying in the breeze. 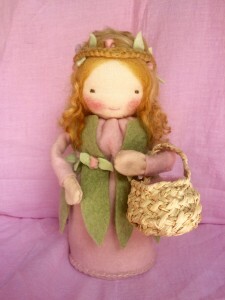 Some of the felt will be used as cloaks and dresses for Lady Spring. Our doll making has been so enjoyable that Linda is offering a day long get together to make Lady Spring dolls on Friday, 9 September. Look out for more details soon. 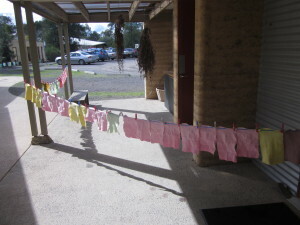 Lots of parents are already sewing and knitting for Spring Fair. Kits to take home to work on are available from Reception or come along to the Parents Room on Mondays after Assembly. 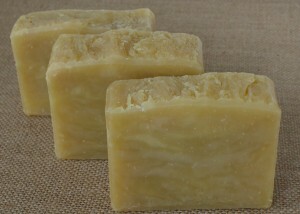 This Saturday is our soap making workshop. We are grateful to Natalie for sharing her skills and knowledge with us and for sourcing the ingredients. You can see more of Natalie’s work at Tribe or online under the Ewe and Yarn label. Some of the soap we make on the weekend will be available for purchase on the Class 3 stall at Spring Fair. CSSK Parents & Friends invite you to join us for a hands-on soap making workshop. We’ll be using a “hot process” method to make soap that is ready to use almost immediately. Olive oil, coconut oil and lye will be provided at a cost of $15. Bring your own add-ins, such as essential oils, petals, ground coffee – whatever takes your fancy. We have 2 litre milk containers available to use as moulds but you are welcome to bring your own mould if you prefer a different shape. Materials provided will make approximately 2 x 2 litre milk containers worth of soap. You are invited to donate a proportion of what you make to the class 3 stall for Spring Fair. If you are able to bring along a glass mixing bowl, a crockpot or a stick blender, that will allow us to make more batches at the same time. Contact Natalie Stevens or Julie Tisdale (0420 318 255) for more information. Please let us know you are coming so we have enough materials. Parents and friends please remember to follow the Victorian Road Laws when entering and leaving the school opposite the golf club. There have been a few near misses lately due to drivers not stopping, giving way or indicating when turning. Our environmentally friendly supplier of toilet paper and hand towels, WGAC, has just made their biggest donation ever to WaterAid. $428,500 has been donated to help build toilets for those in need over the last three years. What a great improvement from their first donation of $2500! More information can be found here.